International Launch Services (ILS) have launched their Proton-M rocket on Wednesday. Launch was on schedule at 18:48 GMT from the Baikonur Cosmodrome in Kazakhstan, with the Proton tasked with deploying the ViaSat-1 telecommunications satellite – the highest throughput satellite ever built – into its GEO transfer orbit, after what will be over nine hours of flight. 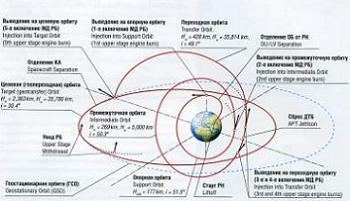 It was a problem with that upper stage which resulted in the loss of the Ekspress-AM4 communications satellite in August – which was not an ILS mission – when the stage, otherwise known as the Briz-M, failed to insert the satellite into the correct transfer orbit due to a problem with the last of the mission profile burns. This failure led to a delay for the ViaSat-1 mission, which was initially scheduled for September. “Immediately after the failure of the Russian Federal Proton mission with the Express AM4 satellite, the Russian Inter-Agency Commission conducted a formal investigation into the cause of the failure. The Inter-Agency Commission identified the cause of the Express AM4 failure as a configuration error in the flight control software of the Proton Breeze-M upper stage,” noted a statement from ViaSat. That final clearance was approved, following a review of the investigation conclusions by a Failure Review Oversight Board (FROB) conducted September 8 and 9 by International Launch Services (ILS) with ViaSat participation. A Russian government launch using the Proton-M and Briz-M since returned the duo to launch action ahead of the previous ILS mission, which successfully lofted the QuetzSat-1 telecommunications satellite for SES into its GEO transfer orbit. As per usual, the Proton M launch vehicle will be utilizing a five-burn Breeze M mission design, following lift off from Pad 39 at Baikonur Cosmodrome, Kazakhstan. 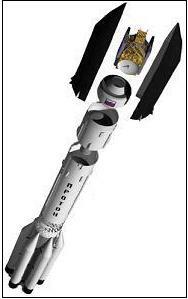 The first three stages of the Proton will use a standard ascent profile to place the orbital unit (Breeze M upper stage and the ViaSat-1 satellite) into a suborbital trajectory. From this point in the mission, the Breeze M will perform planned mission maneuvers to advance the orbital unit first to a circular parking orbit, then to an intermediate orbit, followed by a transfer orbit, and finally to a geosynchronous transfer orbit. Separation of the ViaSat-1 satellite was scheduled to occur approximately 9 hours, 12 minutes after liftoff, later confirmed by ILS. “It is extremely rewarding to be entrusted to launch our customers’ satellites. With this successful launch on ILS Proton, we are able to support ViaSat’s innovative plan to enhance and expand high-speed broadband services with the most powerful all Ka-band satellite in the world,” noted ILS president Frank McKenna. 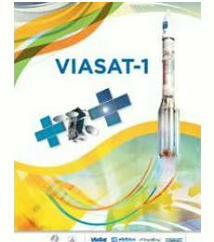 ViaSat-1 is the highest throughput satellite ever built. The total capacity is in excess of 140 Gbps, more than all other communication satellites over North America combined. The all Ka-band spot beam ViaSat-1 is designed to transform the quality of satellite broadband service through a new system design that focuses on maximizing total bandwidth throughput. Via this technique, the cost per bit is reduced to a fraction of that provided by previous generation satellites, significantly changing the economics and performance of satellite communications. The satellite, to be located at 115 degrees W, will use 72 beams to cover 75 percent of the Continental United States, as well as the most populated areas of Alaska, Hawaii, and Canada. Built by Space Systems/Loral, the 6,740 kg spacecraft is expected to have a lifetime of 15 years. This launch marked the first ever mission for ViaSat via ILS, the 19th Space Systems/Loral Satellite Launched on ILS Proton, the fourth ILS Proton Launch in 2011, and the 68th ILS Proton mission overall.